lmharnisch: What Happens in the Monkey House? 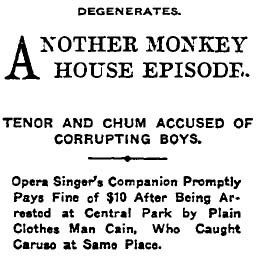 Something curious seems to be going on with opera tenors in the monkey house at New York’s Central Park; perhaps there’s an atmosphere that lends itself to “annoying” people, for the problem of mashers at the monkey house has even inspired a 1907 movie by Biograph. 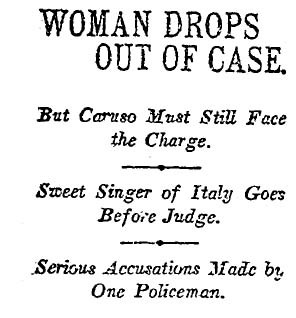 Luckily, Detective J.J. Cain is on the lookout for malefactors who make lewd advances, having arrested Enrico Caruso the year before. Cain’s latest arrests are Leon Cazauran, “a slender young man with pale face and large brown eyes” brought to New York to sing in “Thais” at Oscar Hammerstein’s Manhattan Operahouse, and his companion, Claude Modjeska, “a copper-colored young man,” The Times says. Despite the language handicap (Cazauran didn’t speak English and while Modjeska only knew a bit of English, he was able to act as a translator) the men protested their innocence. Modjeska was fined $10 and the men vanished. The tenor had followed two girls, one of them about 12, and annoyed them. He then turned his attention to three women, one of whom was black, Cain said. 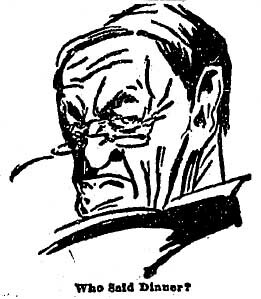 Bonus fact: Caruso was in San Francisco during the 1906 earthquake.